Understanding your peers’ personalities is providing a new frontier in education leadership and team communications. Classes offered through E-Colors in Education are available through a collaboration with Harris County Department of Education’s Teaching and Learning Center. The workshops begin in February and continue through June with various teamwork themes which focus on a personality profile and personal intervention. Customized campus workshops are also available. Discovering your E-Colors is as simple as going to the Equilibria website and completing the free inventory at http://www.equilibria.com/PDI-home. Once discovered, the collaboration begins. Her ah-ha moment came as the 17-year veteran in education applied E-colors as a principal at a charter school in a gang-riddled area of Houston. Knowing how to have conversations with students and staff based on differing character traits helped her to create a safe zone in the school populated with rival gangs: the MS-13 and Cholos. “As a result, we were able to decrease gang violence,” she said. HCDE Curriculum Director for Special Populations Brenda Arteaga was an administrative colleague and friend to Mercado at the time. She too saw the impact. E-colors in Education works with eight characteristics of high-performing teams through the series of workshops at HCDE. They are self-and-team awareness; shared visions and values; clarity of roles and processes; trust; diversity and inclusion; commitment; accountability and learning; and continuous improvement. Personalities are expressed as a combination of two of the total four colors: blue, yellow, red and green. Red is a doer. Green is a thinker. Yellow is a socializer, and blue is a relator or people-oriented personality. E-Colors has been used in the corporate world through the work environment arm for years. In addition to E-Colors in Education, Equilibria also has a sports component arm to promote teamwork. 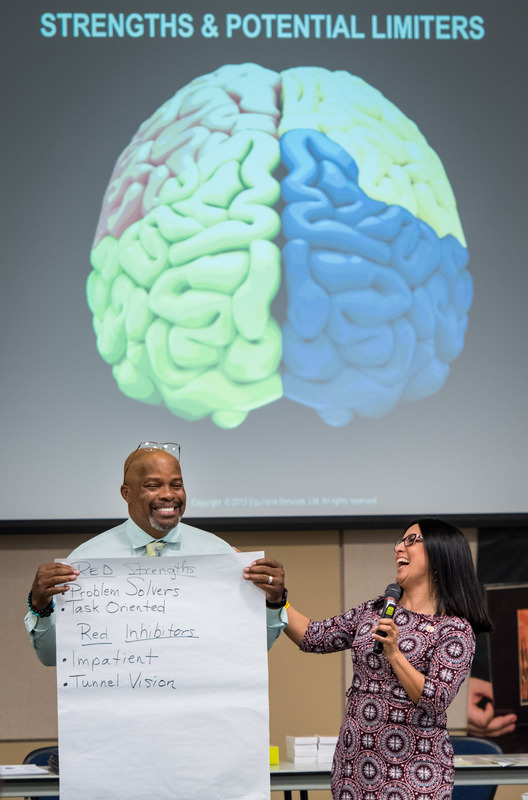 “We are finding tremendous demand for E-colors in Education because people see that it works to help build teamwork and leadership skills,” said Arteaga. For information about workshops offered at HCDE, email Arteaga at barteaga@hcde-texas.org or call 713-696-1304.